The stage was set for an exciting encounter between two live electronic musicians of international standing at Sound of Mu on Tuesday January 25. Diemo Schwarz from IRCAM held a workshop in advanced synthesis and signal processing at NOTAM in the end of January. Diemo Schwarz is one of the leading figures within the live electronics field, and he has developed a number of signal processing tools, including Max/MSP patches such as FTM and CataRT. It was a pleasure for me to be able to play a concert with him again. both played a solo piece each. I played Thomas Dahl’s piece No Reason Aftermath. It was a great atmosphere at the venue. 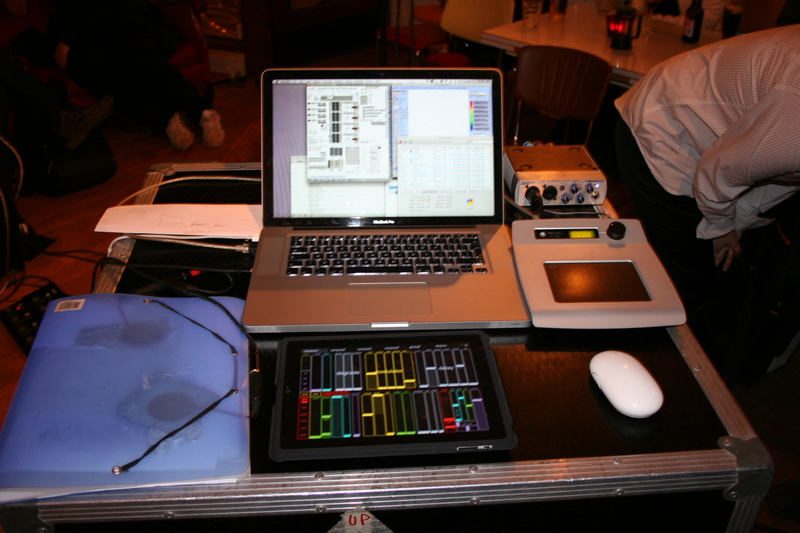 Diemo is using the iPad as a control function for CataRT, as well as a pressure-sensitive MIDI-controller which controls the dynamics. It works so well with the iPad. He can play it like a separate instrument, away from the computer, using the accelerometer. The collaboration with my colleague Terje Moe Hansen was really interesting. He has been researching how Paganini’s violin technique gave extended technical possibilities on the violin in his time. Terje has also made a set of own violin techniques, and he uses his own and Paganini’s techniques together in a virtuoso way. Especially “the other way round hand position”, which means that the whole hand is placed of the left side of the finger-board, and you get access to the thumb as a fifth finger. Terje has no problem making the violin sound like a seagull, and he used all his brilliant techniques in our improvisation. Based on Paganini’s caprice no. 24, we worked with hip-hop loops, free impro over a time-stretched Rachmaninov’s Variations over a theme of Paganini, and fiddling around with the theme itself. Terje also played his own pieces in the concert, and a piece by Ivar Frounberg, joined by the fantastic trombone player Niels-Ole Bo Johansen. He just impressed me with his Sequenza by Berio. 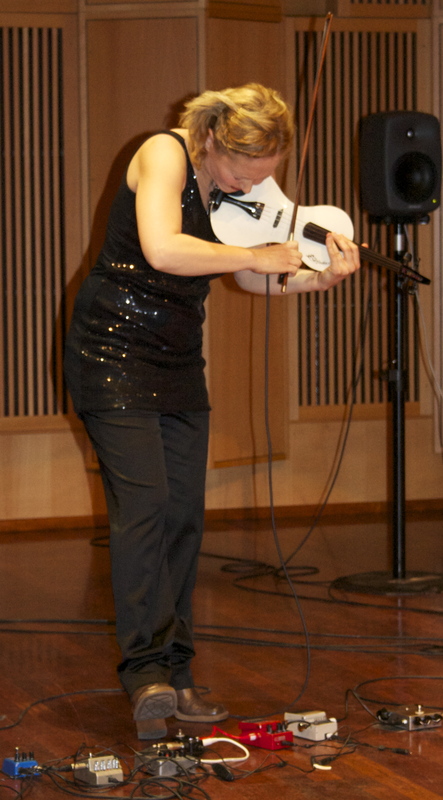 November 8 I made an introduction about noise, which I held at the Levin hall at NMH. I also performed Jon Hegre’s piece TBA. The piece is improvised over certain instructions by the composer, and one of them is to make a wall of noise. Using two fuzz pedals and crush tones, I had expected the piece to be really loud, but I don’t think it was loud enough. Nobody even reacted to the piece after the concert. At the concert, Alexander Refsum Jensenius and I performed our piece Transformation, exploring improvisation in time and space during this concert that also featured pieces by Henrik Hellstenius, Thomas Dahl and an improvisation by Victoria Johnson and Peter Tornquist. 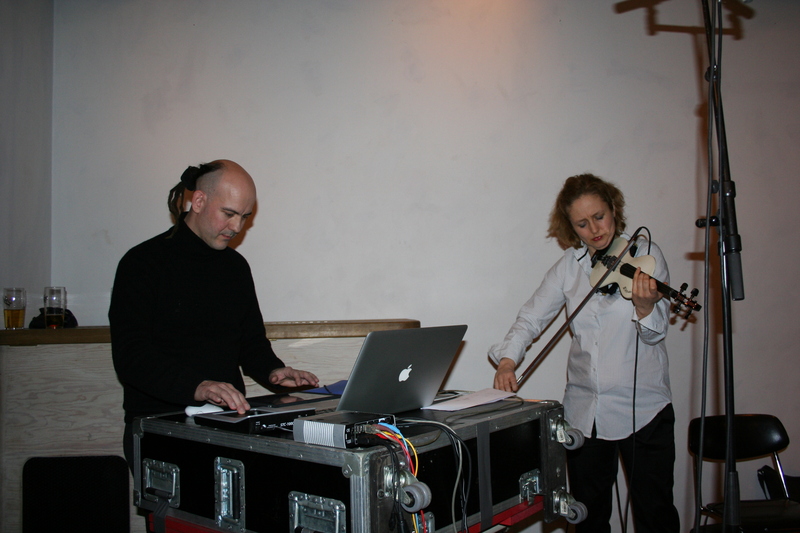 Alexander and I have been collaborating for several years on exploration of various types of technologies for musical expression. The piece currently presented is based on video analysis using modules from the Musical Gestures Toolbox in Jamoma and CataRT. By moving inside a seemingly empty space, I have slowly explored a sonic landscape of thousands of short fragments of various violin sounds. The space thus becomes a musical entity in itself, a space that the violinist both controls and interacts with at the same time. What seemed to be an empty space at first, is left as a sonic space in our memory when the piece ends. For Victoria Counting IV we used the new visual ideas from the workshop (see previous posts), and added a new direction, made mainly by Henrik Hellstenius. The new direction made me very busy on stage, at first sitting on a low stool, after a while started to run when playing, and looking for my lost photos when at the same time looking at all the photos from my life. From the dress rehearsal, kneeling on the little stool. I have decided to make a new version of Victoria Counts by Henrik Hellstenius without video and with a new version of the staging. Henrik has decided to do the main work with the new staging himself, being the person who knows the piece the best (together with me :-D). A visual idea, using pictures from my life on the floor, almost invading me on stage. Another idea is to cut up the music in small pieces and let me search for them. Using long music stands, too long for actually looking, or very small, so that I have to sit on the floor or on a stool, almost kneeling in a kind of meditation pose. Henrik also wanted to try out using mirrors, mirroring myself, but also the audience, so that they can mirror themselves in the chaos that sometimes emerges on stage. The music is cut into pieces, and I am kneeling in front of the small music stand. Henrik also wanted to let me speak about my relation to the piece and how I related to the main topic, distraction vs. focus, stress versus peace, all directed and held together by the counting exercise by Gurdjieff. He wanted me to record my reflections, and also asking myself questions about the main topic. Henrik has made a mix of the sound files, and we are going to try using it in the piece to strengthen the audience’s understanding of the main topic. Each time I work with this piece and have to be confronted with my life, it always makes me emotional. It’s very difficult to keep a distance when the whole thing is actually about your own stuff. Sunniva Bodvin, who is going to be the scenographer in my project, was a great help, seeing all the new props from the outside. We will be able to evaluate the new staging and the new props, and how it influences the piece, on the concert on Sep 3. Strangely enough, after working with Victoria counts for almost 4 years, we still do not completely know how to express the core of the piece. The music is very abstract, but of course, it also has various dramatical levels. It moves from almost total silence to cacophonies of domestic sounds; my voice, almost screaming, counting, sound processing and loud violin playing. I’ve not been able to update this blog since March, due to troubles with my arm. I’m now back in business, planning a solo concert on September 3. Due to the arm problems I’ve had to postpone my final performance, but I will still have a “work in progress” performance on Sep 3. For the first time in 3 years I had the possibility to practice over a long period in the concert hall in the Academy of Music. I had access to the hall for 5 whole working days, and did not have to rig down every evening. I have realized, during this project, that rigging and solving technical problems take – worst case – up to 80-90% of my time. Usually there is too little time for working musically with the right set-up in the right room. The fact that I seldom have access to a big space for more than one day, means that I always feel that I haven’ practised and experimented enough musically. This was also the case the first day of the workshop; Alexander Refsum Jensenius and I used 5 hours to rig up the 8 speakers and the motion capture system (with video analysis) in the hall. On the first day we had only one hour of musical activities, and our brain capacity was rather poor (after removing two Steinways, repairing the door to get the pianos out, fighting with our mixer, placing the video camera 15 m up in the ceiling.) 😀 We decided to let the 4 inner speakers define the soundspace, forming a square. 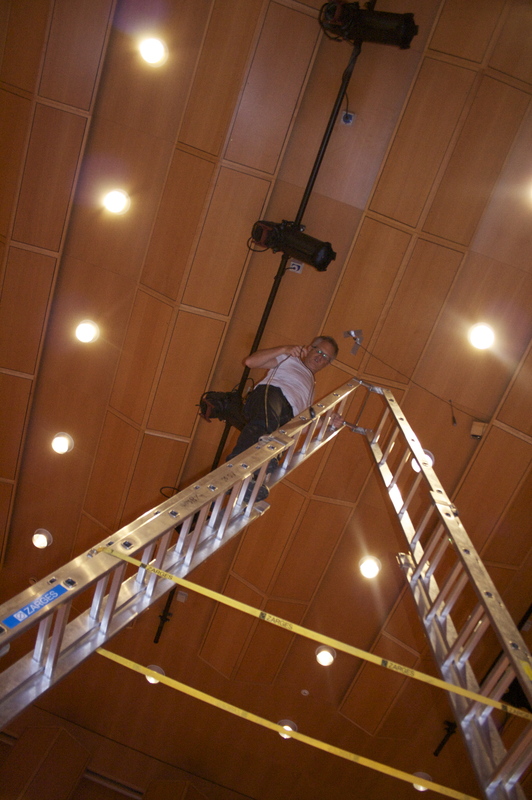 The size of the square was decided by the video camera that was mounted in the ceiling. We tested some new pre-sets in CataRT and found that the pre-set silent segmentation made the sound stay for a long time and made it difficult to interact with the electronics, which is the goal for the whole project. 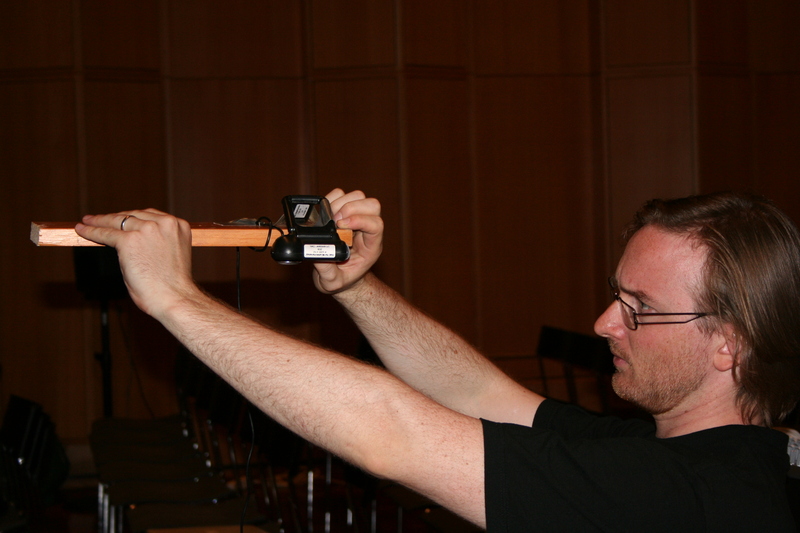 We also experimented with an amount of reverb, because the concert hall in itself has a lot of it. To level equally the sound of the violin and the electronics was also an issue we worked on that day. On August 4, with fresh brains, we started to work musically with our set-up. We used Alexander’s video analysis transition, so that video analysis could be used as a controller for CataRT. 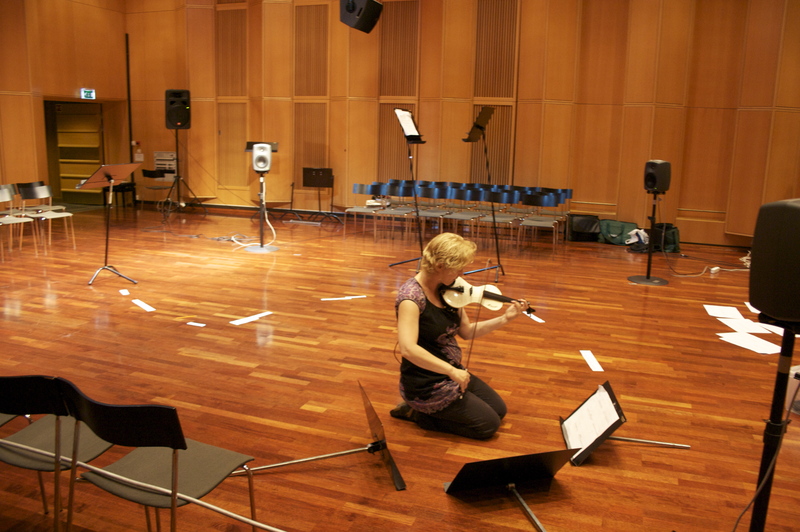 In earlier workshops we have gone through all the pre-sets in CataRT, testing various loudspeaker set-ups, and now we could concentrate on deciding what kind of violin sounds we wanted to use. Strangely enough, some sounds that worked in an non-acoustical room, did not work in the concert hall. The most brutal sounds, like crush tones and strong pizzicati, sounded much too brutal in the hall. 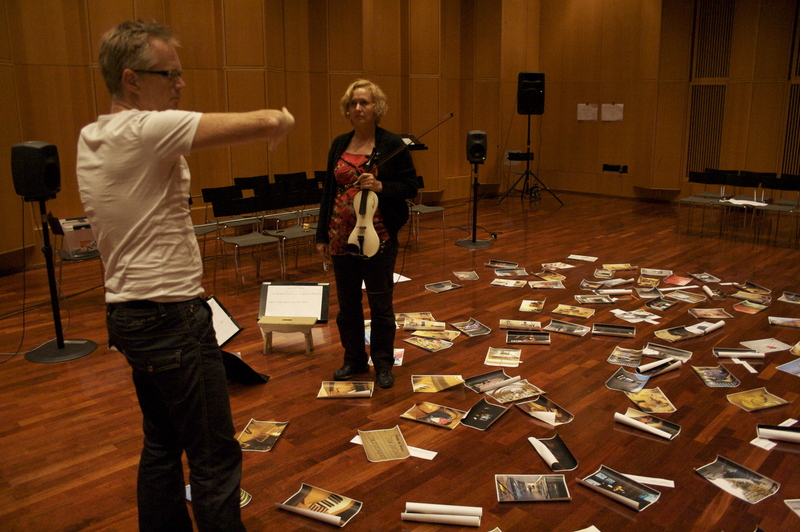 After an hour or two Sidsel Endresen (my superviser in improvisation) turned up to listen to our music. Her feedback was that I should think of the electronics as a musician, a person you play with and against. And to let this interaction guide my movements, and not vice versa. And the music which happens when I don’t play, only move, (ghost playing) is not a goal in itself, but rather a result of a musical process. And the curiosity and eagerness to explore the soundscape which emerges must be what drives you. I’m so glad that we could go more into the musical issues!! Thanks to Sidsel for coming. Busy writing at my artistic reflection, reading a lot, practising, thinking and making important decisions for my end performance, there is not much time to blog and document these days. Since December last year I have been writing on my critical reflection as well as doing a lot of practising on some new pieces. In March I am playing a new piece by Ivar Frounberg and Peter Tornquist with the NMH sinfonietta , a jazz group , Kjell Tore Innervik and my 4 el violin students at NMH. Another intersting book is Eivind Røssaak: “Selviakttakelse” In this book Røssaak discusses the arts tendency to be interested and observe the self. He also discusses craftsmanship versus new tendencies like uncleanness and hybrid art. Very relevant book for reflection on the process with Victoria Counts and for people who are interested in the Knausgård debate. 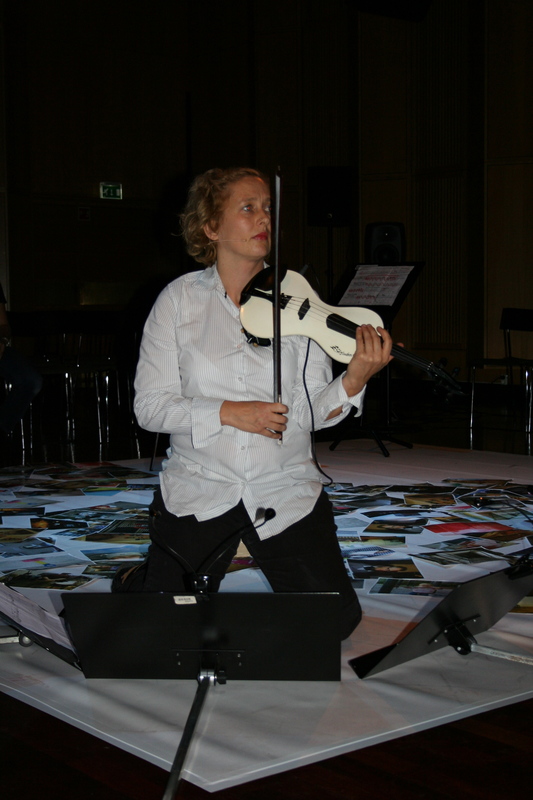 On december 18th 2009 was in Oslo concert-hall listening/watching Leif Ove Andsnes and the south African visual artist Robin Rohde performance. Their aim has been to make the “impossible possible, and how put visuals to music in a way that the visuals builds up the musical material and gives unity”. I will look into the documentation of this project, and heard there should be a documentary at NRK. Their methods of working might be interesting for my project. 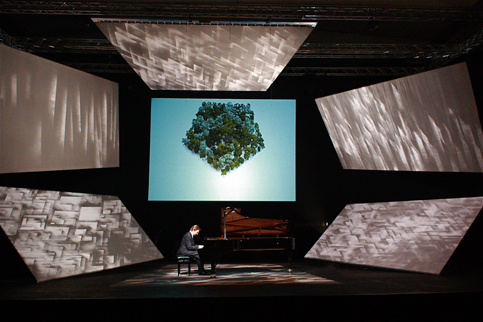 It is great that such a fantastic pianist and musical communicator as Leif Ove Andsnes also does projects were he experiments with new ways of communicating with the audience.